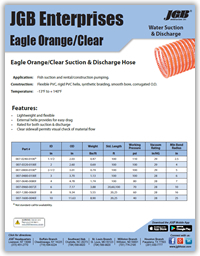 Eagle Orange/Clear Suction and Discharge Hose - JGB Private Brand - Hose by Vendor - JGB Enterprises, Inc.
Suction and discharge hose for use in fish suction and rental/construction pumping. NOTE: Banding coil must be used for 1-1/2", 2", 3", 4", 5" and 6" sizes. * Over flexing or repeated flexing of hose within 18" of fitting is a common cause of hose failure. Installing a 12" - 14" section of our Banding Coil at the end of the hose should be considered. JGB will not be responsible for damage to hose due to over flexing. * Not standard - call for availability.